When the Chorus addresses the audience from the stage at the opening of Shakespeare’s Henry V, he refers to ‘this wooden O’ – a phrase that is commonly understood as an image of an Elizabethan theatre such as The Globe, which was octahedral. 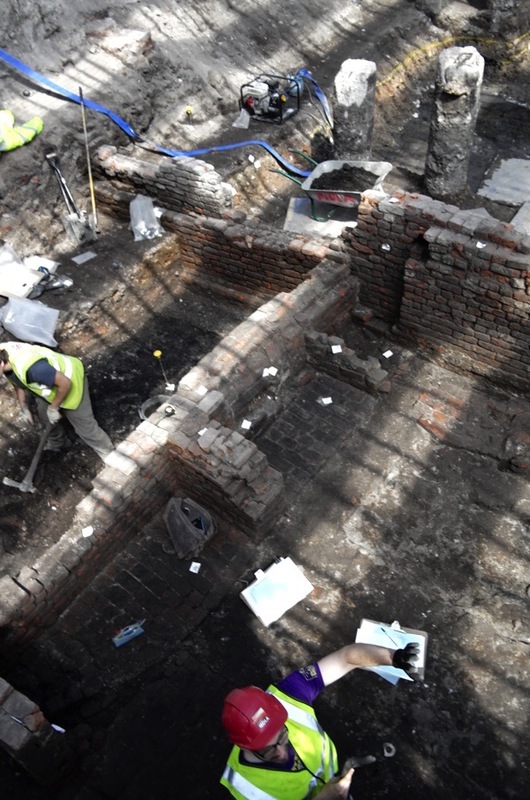 Imagine the surprise of the archaeologists currently excavating the foundations of The Curtain Theatre in Shoreditch, where Henry V is believed to have been first performed, who have discovered that it was rectangular. Yet an ‘O’ is usually rectangular. 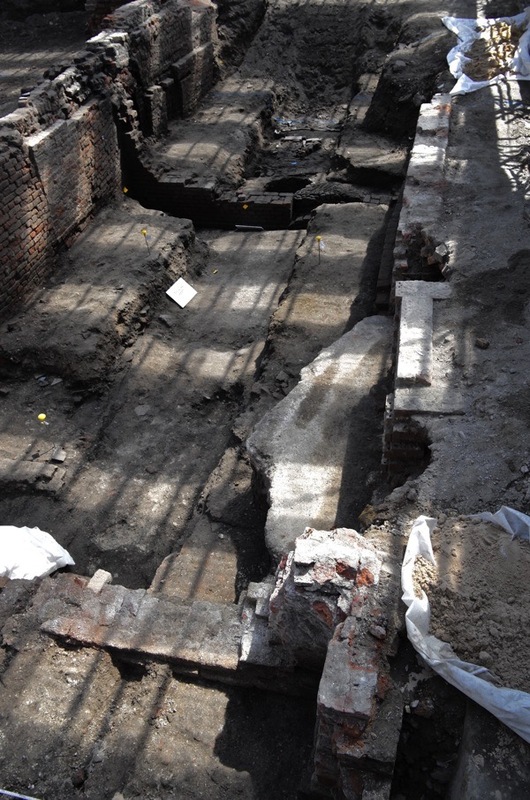 Whether drawn with a pen or as a typeform, it has two longer sides connected by two shorter sides, just as The Curtain Theatre did – arranged with a stage at one end and galleries on three sides, after the model of inn-yards which served as the first theatres. 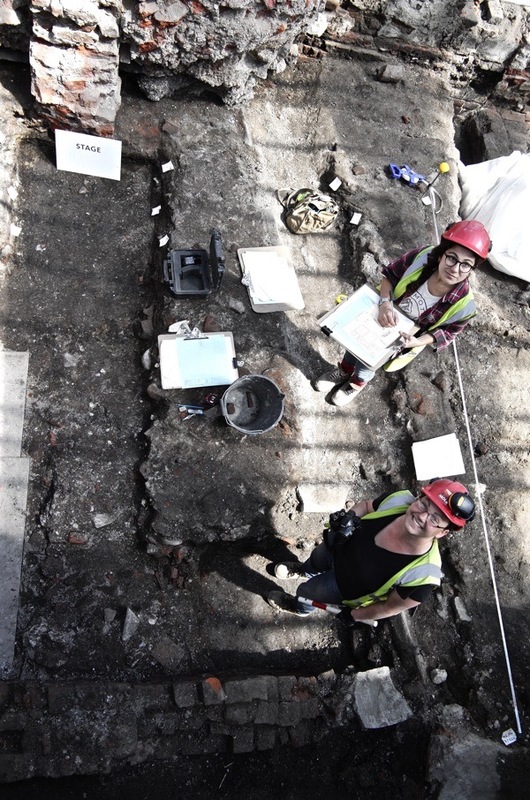 Heather Knight, Museum of London Archaeology site director at the excavations in Curtain Rd was filled with excitement when I met her last week. On the basis of her discovery, she had come to a wider realisation about the theatres of Tudor London. While those on the South Bank, such as The Globe and The Rose, which also served for bear-baiting, appear to have all been round in form, The Curtain Theatre seems to follow the trend for theatres north of the Thames, such as The Fortune and The Boar’s Head which were also used for fencing displays, to be rectangular. A similar distinction may be appreciated today at the National Theatre in the difference between The Olivier and Lyttleton Theatres. In fact Henry V and Romeo & Juliet, which both first saw the light of day at The Curtain, contain significant amounts of swordplay. An element that reflected the audience’s expectations in a venue with a wide stage that was also used for fencing displays and where dramatic scenes were sometimes interposed into such displays to create context for the sword-fighting episodes. Grenade’s account testifies to both The Theatre and The Curtain as being ‘very fine theatres’ while celebrating the larger Theatre over The Curtain, and confirming the use of these buildings for the performance of entertaining fictional dramas. These tangible discoveries are remarkable, yet the most powerful import of this excavation is the experience of visiting the site and recognising that you are there in the place where it all actually happened. Incontrovertibly – you realise – William Shakespeare was once here. 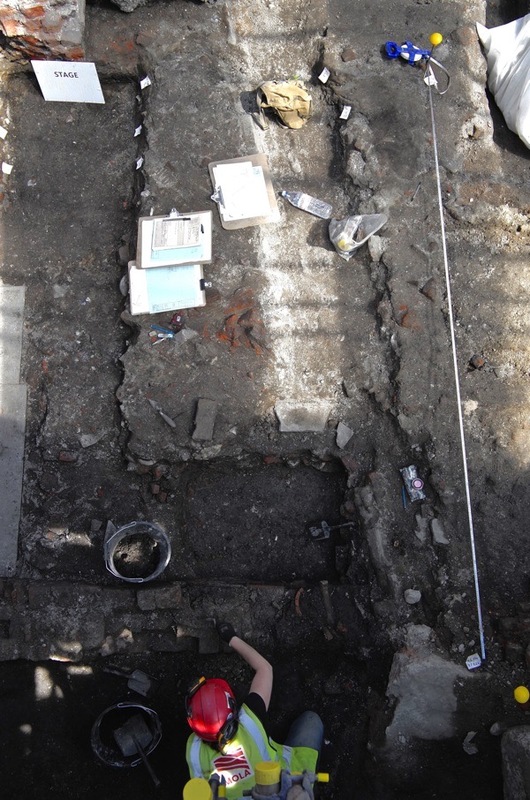 You walk through the commercial hoarding in Curtain Rd to find yourself on a raised walkway suspended over the ground level of the dig, several metres below, where archaeologists in hard hats scrape at the soil. Once you realise that the location of this entrance approximates to the entrance to The Curtain Theatre itself, you cannot ignore a heart-stopping sense of time travel – of being suspended over the Tudor audience, like a spirit on a wire as a one of the gods appearing at an opportune moment in the drama. The walkway delivers you to a point above the stage and a glance to either side gives you the locations of the galleries which define the width of the performing area. In front of you is the back wall of the stage – a former garden wall, co-opted into the theatre building and pierced to create dramatic entrances. You turn around and you can see the depth of the audience and imagine the gaze of the actor across the sea of expectant faces. This is where Shakespeare saw Henry V and Romeo & Juliet performed, and the discovery by the archaeologists of a fragment of a ceramic bird whistle at the rear of the stage has acquired a unique poignancy in this location. For a few weeks, you can visit the site where the actors heard that birdcall more than four hundred years ago when these words were first spoken. You can see the foundations laid out upon the ground with walls extending in all directions, granting an extraordinary vision of a Shakespearian theatre in ‘a fine and pleasant meadow.’ By 1625, The Curtain had been redeveloped into tenements and a brick hearth of this era, still blackened by fire, recalls the domestic life that superseded it. Next month, the archaeologists will be called upon to designate the boundaries of this Ancient Monument, defining what will be preserved and what will be destroyed. Within a few years, you will be able to visit the monument enshrined beneath a shopping mall at the foot of tower of luxury flats, but – before that future arrives – I urge you to see it as they have found it. 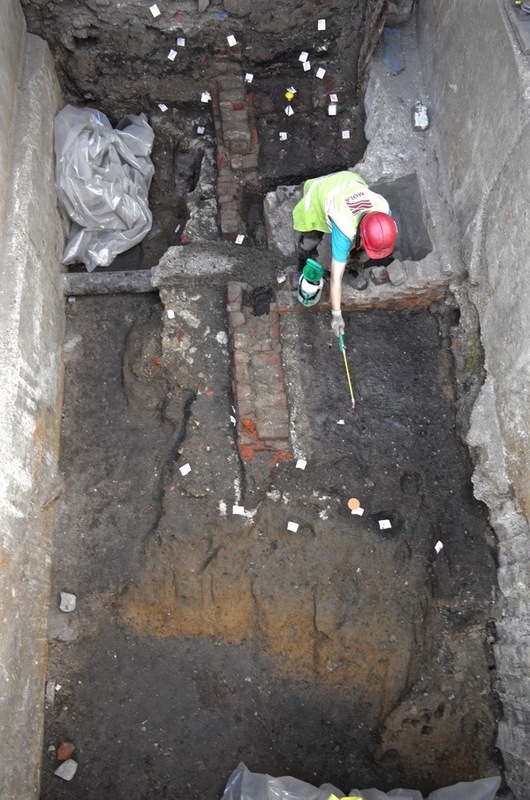 It is still possible to visit the site of The Curtain Theatre before excavations are completed in a few weeks time. Details can be found at Museum of London Archaeology. Aren’t we all “suspended like spirits on a wire” as we float through life? Great piece and very interesting. What a pity that on immediately going to their website I found all the viewings are sold out and no more are planned! Thanks for your thrilling description of the remains of the Curtain Theatre which will live on into infinity unlike the archeological site which presumably will be destroyed by the deep foundations needed for the tower block. Sadly the tours seem to be sold out. How lucky I was this morning to have seen your photographs and to have read what it was like for a fellow playwright and theatre director to look down and across this rare and precious Shakespearian place. Excellent article. Such a shame they can’t scrap the mall and build a reconstruction of the theatre instead! A shopping mall and luxury flats … what would Shakespeare make of that! I don’t understand why modern buildings should not be built OVER a restored Curtain theatre, as an archaeological visitor centre or, ideally, rebuilt and preserved in a time capsule of concrete and steel suitable for theatrical performances.